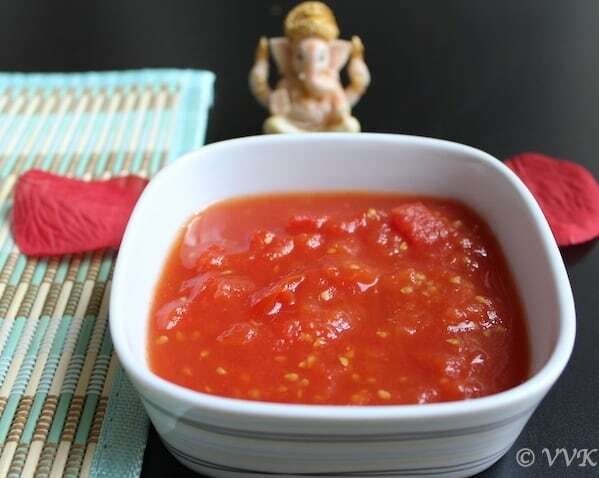 The second dish that I am preparing for the BM is sweet tomato pachadi which can be done within 15 minutes actually :-) :-) Its a two ingredient recipe. All you need is ripe tomatoes and sugar thats all. Usually for Tamil New year and Ugadi, we prepare something sweet and sour. Usually it will be the Raw Mango Pachadi. Initially it was difficult for me to find raw mangoes and preparing that on a busy week day morning was difficult also. That’s when my MIL suggested this. 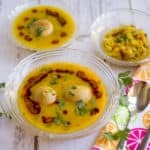 Instead of mango pachadi, I started preparing this on week days for prasadam. This is a great rice accompaniment also. 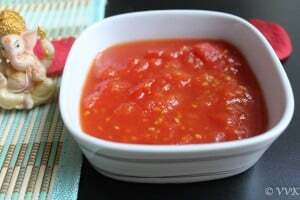 In a microwave safe bowl, add the finely chopped tomatoes and microwave them for 1 minute. 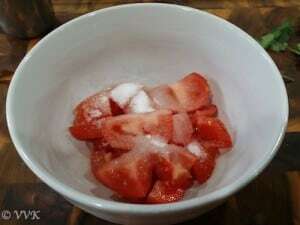 Take it out and mash it and add sugar and mix well. Again microwave for 2 to 3 minutes and mix well. Basically you need to microwave till the tomatoes are soft and mushy. It took me 6 minutes for this pachadi. Depending upon the microwave the time may vary. 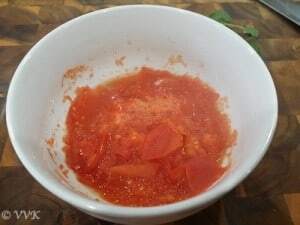 As I mentioned you have to microwave till the tomatoes blends together and becomes soft and mushy. Make sure you stir for every 2 to 3 minutes. 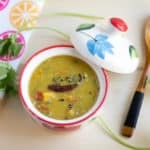 A quick and yummy microwave tomato sweet pachadi or raita. 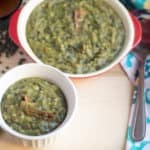 A great rice accompaniment and a bread spread. 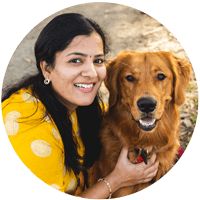 Wow, such a quick and easy tomato pachadi. 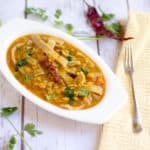 Tomato pachadi looks so yum!! 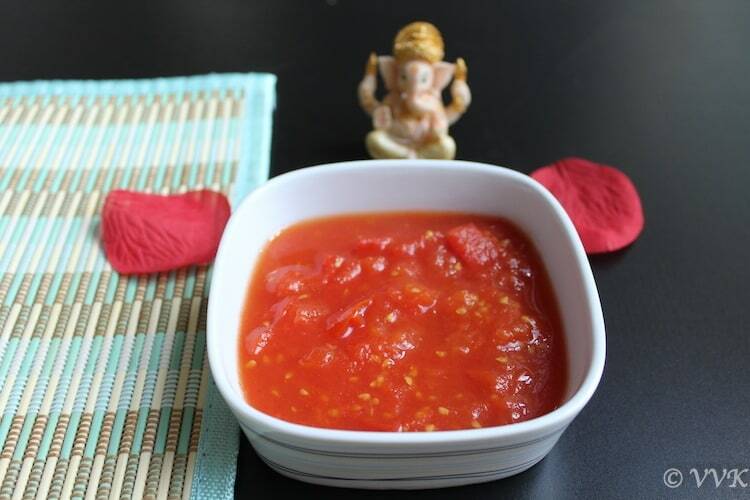 A good and easy tomato pachadi. Tomato pachadi sounds interesting..never made it myself.. 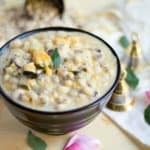 Very quick and delicious pachadi, easy dish as well. slurp!!! would love to finish it completely!! Tomato pachadi as festival prasad is so new to me. Love the vibrant color of the tomatoes. Thanks varada. Usually we go for mango pachadi. Tangyness and sweetness. And you can get the same with this pachadi too. Just a time saver..